Liam is a 5-year-old little boy who just entered kindergarten at Orchard Hill Elementary. He was born on November 13, 2012. Liam was born with multiple birth defects and has spent much of his young life receiving many medical treatments, including several surgeries. At just 4-months-old he was experiencing congestive heart failure and had open-heart surgery. The surgery was successful, but Liam still suffers with a dysrhythmia, a heart murmur, and he has an enlarged heart. He will most likely need another heart surgery in his future. 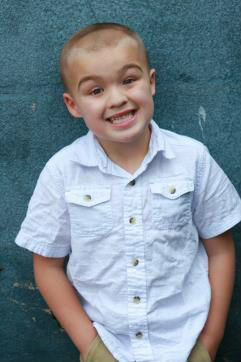 Liam has a soft cleft palate, has experienced seizures, and struggles with sleep apnea. At one-point he required the use of a feeding tube due to his “failure to thrive” status. Liam has also suffered from mini-strokes that have caused him to have, what doctors refer to as “dead spots,” in his brain. Liam also suffers with three neurological conditions; Tourette’s syndrome, ADHD, and sensory processing disorder. Due to his heart disorder, Liam cannot take most medications that could help balance the many conditions he is challenged with daily. Liam requires the service of neurological and occupational therapies, which specialize in addressing his Tourette’s and sensory processing disorder. Even with everything he is faced with, he remains a very loving and smiley little boy. He loves telling jokes, playing Minecraft, loves people, and he loves his pet dog. Liam will be adopted as a Sparrow to Orchard Hill Elementary. Students at Orchard Hill will work hard to raise money for Liam through sponsored community service and fundraising projects.